Roseau, Dominica – April 2, 2008………Parliamentary Representative for the Castle Bruce constituency, Hon. Loreen Bannis- Roberts was in ebullient mood last Friday for the official opening of the much anticipated type 3 Health Centre situated in the middle of Castle Bruce. In an address charged with emotion and undiluted joy, Hon. Loreen Bannis-Roberts spoke of her personal satisfaction that despite all the challenges going back over six years, a new health centre for the Castle Bruce health district is no longer a dream, but a reality. “I stand here this afternoon having experienced and still experiencing the fruits of the spirits- love, joy, peace, patience, kindness, goodness, faithfulness, gentleness, self-control. “For me personally, the opening of this facility is indicative of a mission accomplished. I remained focused and paid attention to every detail, every step of the way. The journey towards the conceptualization of this facility to the reality that is here before us today was a challenging and at times a painful one. However it was a rewarding experience. Hon. Loreen Bannis-Roberts also listed the investments being made by her government in the health sector in Dominica. Mention was made of the significant sums that have been invested in the training of nurses, (218), the construction of health centres and clinics island-wide and the opening of the diagnostic centre in Portsmouth and the Intensive Care Unit at the Princess Margaret Hospital. The new health centre at Castle Bruce was funded by the European Commission at a cost of $1.3 million. 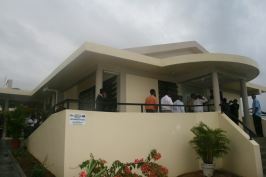 This new modern facility , which will serve about 5000 persons from the Castle Bruce health district boasts: one screening room with an accompanying doctor’s room; one sterilization room; one pharmacy section; one dentistry section with a compressor; one casualty area accommodating two to three beds and a washroom facility; one environmental health officer’s office; one community health nurse’s room; one family nurse practitioner’s room; one delivery room with the required facilities; a waiting area with male and female washroom facility and a car park. Other addresses at the opening ceremony came Prime Minister, Hon. Roosevelt Skerrit, Minister for Health, Hon. John Fabien, Director of Primary Health Care, Dr. Griffin Benjamin, District Medical Officer, Mr. Don Esprit and Mr. Eddison Henry from the National Authorizing Office of the European Development Fund.